Sensation refers to our ability to detect or sense the physical qualities of our environment. Sensation refers to our ability to detect and sense the internal and external physical qualities of our environment. Our senses include both exteroception (stimuli that occur outside of our body) and interoception (stimuli occurring inside of our bodies). Our primary senses are considered to be sight, hearing, taste, smell, and touch. All senses require one of four fundamental sensory capacities: chemoreception, photoreception, mechanoreception, or thermoreception. The peripheral nervous system (PNS) consists of sensory receptors to communicate with other parts of the body. chemoreception: A physiological response to chemical stimuli. mechanoreception: A physiological response to mechanical forces like pressure, touch, and vibration. photoreception: A physiological response to light, as occurs during vision in animals. thermoreception: A physiological response to relative or absolute changes in temperature. Our senses can be broadly grouped into exteroception, for the detection of stimuli that occur outside of our body, and interoception, for stimuli occurring inside of our bodies. However, what constitutes a sense is a matter of great debate, leading to difficulties in precisely defining what it is. Traditionally, human beings are considered to have five main senses: sight, hearing, taste, smell, and touch. The peripheral nervous system (PNS) consists of sensory receptors that extend from the central nervous system (CNS) to communicate with other parts of the body. These receptors respond to changes and stimuli in the environment. Sense organs (made up of sensory receptors and other cells ) operate the senses of vision, hearing, equilibrium, smell, and taste. Sight or vision (ophthalmoception) is the ability of the eye(s) to focus and detect images of visible light on photoreceptors in the retina that generate electrical nerve impulses for varying colors, hues, and brightness. There are two types of photoreceptors: rods and cones. Rods are very sensitive to light, but do not distinguish colors. Cones distinguish colors, but are less sensitive to dim light. The inability to see is called blindness. Hearing or audition (audioception) is the sense of sound perception. Mechanoreceptors in the inner ear turn vibration motion into electrical nerve pulses. The vibrations are mechanically conducted from the eardrum through a series of tiny bones to hair-like fibers in the inner ear that detect the mechanical motion of the fibers. Sound can also be detected as vibrations conducted through the body by tactition. The inability to hear is called deafness or hearing impairment. Taste (gustaoception) refers to the ability to detect substances such as food, certain minerals, poisons, etc. The sense of taste is often confused with the concept of flavor, which is a combination of taste and smell perception. Flavor depends on odor, texture, and temperature as well as on taste. Humans receive tastes through sensory organs called taste buds, or gustatory calyculi, concentrated on the upper surface of the tongue. Five basic tastes exist: sweet, bitter, sour, salty, and umami. The inability to taste is called ageusia. The olfactory system is the sensory system used for the sense of smell (olfaction). This sense is mediated by specialized sensory cells of the nasal cavity. In humans, olfaction occurs when odorant molecules bind to specific sites on the olfactory receptors in the nasal cavity. These receptors are used to detect the presence of smell. They come together at a structure (the glomerulus) that transmits signals to the olfactory bulb in the brain. The inability to smell is called anosmia. Touch or somatosensation (tactioception, tactition, or mechanoreception), is a perception resulting from the activation of neural receptors in the skin, including hair follicles, tongue, throat, and mucosa. A variety of pressure receptors respond to variations in pressure (firm, brushing, sustained, etc.). The touch sense of itching is caused by insect bites or allergies that involve special itch-specific neurons in the skin and spinal cord. The loss or impairment of the ability to feel anything touched is called tactile anesthesia. Paresthesia is a sensation of tingling, pricking, or numbness of the skin that may result from nerve damage and may be permanent or temporary. Pain or nociception (physiological pain): Signals nerve and other tissue damage. Balance or equilibrioception: Allows the sensing of body movement, direction, and acceleration, and to attain and maintain postural equilibrium and balance. Body awareness or proprioception: Provides the parietal cortex of the brain with information on the relative positions of the parts of the body. Sense of time or chronoception: Refers to how the passage of time is perceived and experienced but is not associated with a specific sensory system. According to psychologists and neuroscientists, however, human brains have a system governing the perception of time. Temperature sensing or thermoception: The sensation of heat and the absence of heat (cold). If interoceptive senses are also considered, sensation can be expanded to include stretch (as in muscles or organs like the lungs), oxygen and carbon dioxide sensing, pH sensing, and more. Our nervous system has sensory systems and organs that mediate each sense and these systems rely on chemoreceptors, photoreceptors, mechanoreceptors, or thermoreceptors to detect the state of the internal or external environment. 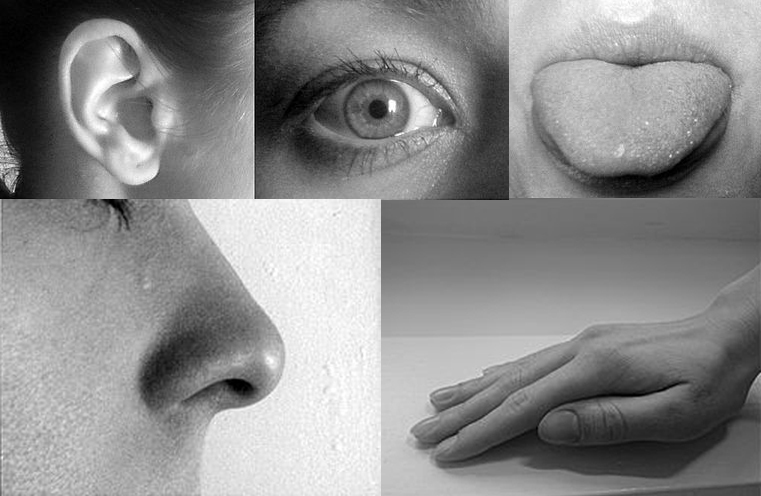 The five senses: Photographic depiction of the five senses. The goal of sensation is detection, while the goal of perception is to create useful information about our environment. Sensation is a function of the low-level, biochemical and neurological mechanisms that allow the receptor cells of a sensory organ to detect an environmental stimulus. Perception refers to the mental processes that represent understanding of the real-world causes of sensory input. Neural signals are transmitted to the brain and processed; the resulting mental recreation of the distal stimulus is the percept. Perception is particularly important to our ability to understand speech. After processing the initial auditory signal, speech sounds are further processed to extract acoustic cues and phonetic information. Perception: The organization, identification, and interpretation of sensory information in order to construct a mental representation through the process of transduction, during which sensors in the body transform signals from the environment into encoded neural signals. reverberation: The persistence of sound after a sound is produced (such as an echo). transduction: The conversion of a stimulus from one form to another. sensation: The function of the low-level biochemical and neurological events that occur when a stimulus activates the receptor cells of a sensory organ. Sensation and perception are two distinct stages of processing during human sensing. Sensation is a function of the low level, biochemical, and neurological mechanisms that allow the receptor cells of a sensory organ to detect an environmental stimulus. 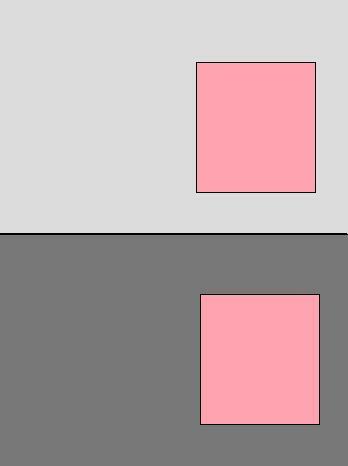 Color optical illusion: The brain interprets the pink cube on the light gray background as being a darker shade than the pink cube on the dark gray background. Perception refers to the mental processes that are reflected in statements like “I see a blue wall” that represent understanding of the real-world causes of sensory input. In other words, the goal of sensation is detection, while the goal of perception is to create useful information about the environment. Stimuli from the environment (distal stimuli) are transformed into neural signals, which are then interpreted by the brain through a process called transduction. Transduction can be likened to a bridge connecting sensation to perception. This raw pattern of neural activity is called the proximal stimulus. The neural signals are transmitted to the brain and processed. The resulting mental recreation of the distal stimulus is the percept. The sound stimulating a person’s auditory receptors is the proximal stimulus, and the brain’s interpretation of this as the ringing of a telephone is the percept. All perception involves signals in the nervous system that result from physical stimulation of the sense organs. For example, vision involves light striking the retinas of the eyes, smell is mediated by odor molecules, and hearing involves sound waves. However, perception is not the passive receipt of these signals, but is a process of organization, identification, and interpretation. Although the senses were traditionally viewed as passive receptors, the study of illusions and ambiguous images, has demonstrated that the brain’s perceptual systems actively influence sensory systems in an attempt to construct useful representations of our environment. The Necker cube and Rubin vase: These are two optical illusions that illustrate how perception may differ from reality. On the left, we see a cube when in fact it is a flat image on our screen. On the right, the vase actually resembles two faces looking at each other. Perception is particularly important to our ability to understand speech. The sound of a word can vary widely according to the words around it and the tempo of the speech, as well as the physical characteristics, accent, and mood of the speaker. Listeners manage to perceive words across this wide range of different conditions. Another variation is that reverberation can make a large difference in sound, such as hearing a word spoken from the far side of a room and the same word spoken up close. The process of perceiving speech begins at the level of the sound within the auditory signal and the process of audition. After processing the initial auditory signal, speech sounds are further processed to extract acoustic cues and phonetic information. This speech information can then be used for higher-level language processes, such as word recognition. A sensory modality (also called a stimulus modality) is an aspect of a stimulus or what is perceived after a stimulus. The basic sensory modalities include: light, sound, taste, temperature, pressure, and smell. A broadly acceptable definition of a sense is: A system that consists of a group of sensory cell types, responding to a specific physical phenomenon, and corresponding to a particular group of regions within the brain where the signals are received and interpreted. Multimodal perception is the ability of the mammalian nervous system to combine different inputs of the sensory system. Nociception (physiological pain ) signals nerve damage or damage to tissue. The three types of pain receptors are cutaneous (skin), somatic (joints and bones), and visceral (body organs ). Proprioception, the kinesthetic sense, provides the parietal cortex of the brain with information on the relative positions of the parts of the body. modality: Also known as stimulus modality, it is one feature of a complex stimulus; for example, temperature, pressure, sound, or taste. utricle: Stimulates hair cells of the inner ear to detect motion and orientation. saccule: A bed of sensory cells situated in the inner ear that translates head movements into neural impulses that the brain can interpret. circadian: Any biological process that displays an endogenous, entrainable oscillation of about 24 hours. ultradian: A recurrent period or cycle repeated throughout a 24-hour circadian day. bipolar cell: Specialized sensory neuron for the transmission of special senses. Senses are transducers from the physical world to the realm of the mind. Another broadly acceptable definition of a sense is: A system that consists of a group of sensory cell types, responding to a specific physical phenomenon, and corresponding to a particular group of regions within the brain where the signals are received and interpreted. Disputes about the number of senses typically arise around classification of the various cell types, and their mapping to regions of the brain. A sensory modality (also called a stimulus modality) is an aspect of a stimulus or what is perceived after a stimulus. The term sensory modality is often used interchangeably with sense. The basic sensory modalities include: light, sound, taste, temperature, pressure, and smell. The sensory modality for vision is light. To perceive a light stimulus, the eye must first refract the light so that it directly hits the retina. The transduction of light into neural activity occurs via the photoreceptors in the retina. When a particle of light hits the photoreceptors of the eye, the photopigment of the photoreceptor undergoes a chemical change leading to a chain of chemical reactions occur. A message is sent to a neuron called the bipolar cell through the use of a nerve impulse. Finally, a message is sent to the ganglion cell and then, finally, the brain. The sensory modality for audition is sound. Sound is created through air pressure. A vibrating object compresses the surrounding molecules of air as it moves towards a given point, and expands the molecules as it moves away from the point. The eardrum is stimulated by vibrations in the air. It collects and sends these vibrations to receptor cells. 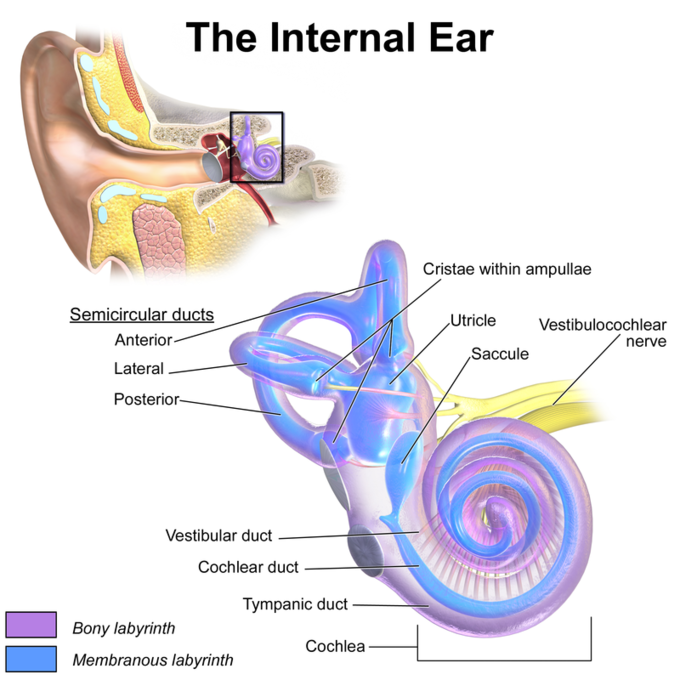 The ossicles (three tiny bones in the middle ear) pass the vibrations to the fluid-filled cochlea (a spiral, shell-shaped auditory organ of the inner ear ). The vibrations move through the liquid in the cochlea where the receptive organ is able to sense it. Taste stimuli are encountered by receptor cells located in taste buds on the tongue and pharynx. Receptor cells disseminate onto different neurons and convey the message of a particular taste in a single medullar nucleus. Taste perception is created by combining multiple sensory inputs. Different modalities help determine the perception of taste. Temperature modality excites or elicits a symptom through cold or hot temperature. The cutaneous somatosensory system detects changes in temperature. Thermal stimuli from a homeostatic set point excite temperature specific sensory nerves in the skin. Specific thermosensory fibers respond to warmth and to cold. Tactile stimulation can be direct, such as through bodily contact, or indirect, such as through the use of a tool or probe. Tactual perception gives information regarding cutaneous stimuli (pressure, vibration, and temperature), kinesthetic stimuli (limb movement), and proprioceptive stimuli (position of the body). The sense of smell is called olfaction. Materials constantly shed molecules, which float into the nose or are taken in through breathing. Inside the nasal chambers is the neuroepithelium lining. It contains the receptors responsible for detecting molecules that are small enough to smell. These receptor neurons then synapse at the olfactory cranial nerve, which sends the information to the olfactory bulbs in the brain for initial processing. Multimodal perception is the ability of the mammalian nervous system to combine all of the different inputs of the sensory system to result in an enhanced detection or identification of a particular stimulus. Integration of all sensory modalities occurs when multimodal neurons receive sensory information that overlaps with different modalities. Multimodal perception comes into effect when a unimodal stimulus fails to produce a response. Multisensory perception: This is a diagram of how multimodal perception is created by the overlapping and combining of different inputs from the sensory systems. Balance (or equilibrioception) is the sense that allows an organism to sense body movement, direction, and acceleration, and also attain and maintain postural equilibrium and balance. The organ of equilibrioception is the vestibular labyrinthine system found in both of the inner ears. In technical terms, this organ is responsible for two senses: angular momentum and acceleration (known together as equilibrioception). The vestibular nerve conducts information from sensory receptors in three ampulla, each of which sense fluid motion in three semicircular canals caused by a three-dimensional rotation of the head. The vestibular nerve also conducts information from the utricle and the saccule; these contain hair-like sensory receptors that bend under the weight of otoliths (small crystals of calcium carbonate) that provide the inertia needed to detect head rotation, linear acceleration, and the direction of gravitational force. Inner ear: Inner ear anatomy showing utricle, saccule, and vestibular nerve. Thermoception is the sense of heat or absence of heat (cold) by the skin and internal skin passages. Perceiving changes in temperature is referred to as heat flux (the rate of heat flow) in these areas. There are specialized receptors for cold (declining temperature) and heat. The cold receptors infer wind direction, an important part in the animal’s sense of smell. The heat receptors are sensitive to infrared radiation and can occur in specialized organs, for instance in pit vipers. The thermoceptors in the skin are quite different from the homeostatic thermoceptors in the brain (hypothalamus), which provides feedback on internal body temperature. Proprioception, the kinesthetic sense, provides the parietal cortex of the brain with information on the relative positions of the parts of the body. Neurologists test this sense by telling patients to close their eyes and touch their own nose with the tip of a finger. Assuming proper proprioceptive function, at no time will the person lose awareness of where their hand actually is, even though it is not being detected by any of the other senses. Proprioception and touch are related in subtle ways, and their impairment results in deep and surprising deficits in perception and action. Nociception (physiological pain) signals nerve or other tissue damage. The three types of pain receptors are cutaneous (skin), somatic (joints and bones), and visceral (body organs). It was previously believed that pain was simply the overloading of pressure receptors, but research in the first half of the 20th century showed that pain is a distinct phenomenon that intertwines with all of the other senses, including touch. Chronoception refers to how the passage of time is perceived and experienced. Although the sense of time is not associated with a specific sensory system, psychological and neuro-scientific research indicates that human brains do have a system governing the perception of time. It is composed of a highly distributed system involving the cerebral cortex, cerebellum and basal ganglia. One particular component, the suprachiasmatic nucleus, is responsible for the circadian (daily) rhythm, while other cell clusters appear capable of shorter-range (ultradian) timekeeping.